The middle of the middle is the middle, regardless of power. I shoot the same scope I hunt. 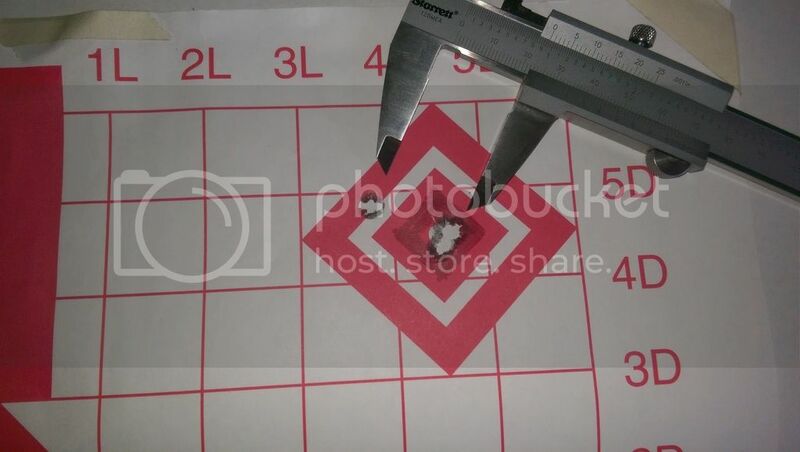 If shooting a target farther out make sure the aim point is the right shape/size to get the center in the same point with the least amount of slop. If our load is capable of cloverleafing in general it shouldn't matter at 100yd if using 7x or something higher. They are correct and center is center. Now it might help to get a target that fits your power range at 100 yards to get the most precise hold for shot to shot accuracy. I've attached a target company that makes different sizes and the paper stock is thick and is punched so it can be put in a three ring binder, and has areas to write your load data on. They are really nice. I have another one at home and I can't think of the name of these targets but I will find those and give you the link also. The other ones are black squares. One might fit your eye better than the other. I shot a 3 shot group at 500 yards with my 30-06 that has a 4x fixed Leupold on it that was less than three inches center to center. The 7x setting on your scope should serve you a lot better than you imagine. I have a couple rifles with fixed power 6x scopes on those and I love them. Have never felt short changed using them. That 30-06 I talk about will put three shots touching at 100 yards, that with the 4x power~!! I've found a simple 3/4" square with a 6x scope to be about perfect at 100 yards. High power scopes can induce "target panic" or make you feel like you can't hold still enough to shoot. I think you'll be quite surprised how capable you'll be with a low power scope. FOV is never a bad thing either. I've heard it really helps to spot misses too. I get what the OP is saying. I have a tough time with lower power scopes for target shooting. Maybe i need a bigger target as well. With a 2-7 vx-2 the crosshair will completely cover a 1in square @100 Making it tough to hold in the same spot every time. What size/shape aimpoint are you guys using for low power scopes? To the OP. with higher power scopes i have the best luck with a red square so i can center the crosshair by dividing the square evenly. Does not work for me with low power scopes but maybe it would for you. Perhaps try a thick outline diamond target, use the 4 points of the diamond to align your crosshair bars on. I find ~1/4" thick lines to be nicely visible at 100yd. I do a lot of shooting with a 2.5 Leupold with a heavy duplex, I use the corner of the reticle for precise aiming rather than the whole duplex. I can get 1MOA groups pretty reliably using that system. I have done load development in two rifles using the same 2.5 leupold, and was able to get decent results 1 moa ish (35 whelen and 45-70). What I didn't like was not being able to see 35 cal holes at 100, and barely being able to make out the 45 cal holes. 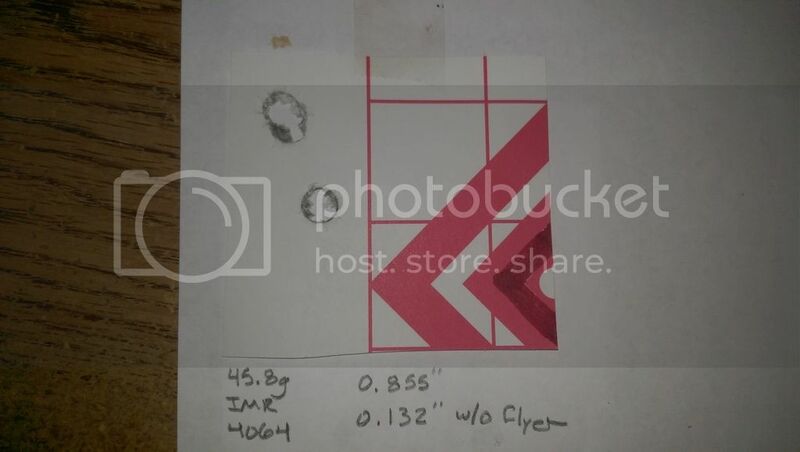 I've got a 2-7 VX2 on my Tikka 30-06 and don't have any issue seeing those little orange 1" target stickers on a standard sheet of paper at 100 yards and using the Barnes 168 TTSX I was able to get MOA groupings. I'll respectfully disagree with bhylton, the reticle doesn't cover the entire circle. There's not a LOT of orange peeking out, but it's enough that I can tell if I'm centered on the dot based on the relative size of the orange pie slices. I'm shooting off of a plastic folding table with a sandbag up front and a sock full of popcorn under the rear of the stock. Off of sticks or a backpack it'd probably be harder to see the sticker around the reticle. When I move back to 200 I upgrade to the 2" stickers, but at that point I'm shooting off of sticks to replicate field type conditions and I'm mostly just concerned about getting hits within a 10" circle. If you are having problems trying to holding on a dot, diamond, etc., draw a upside down "t",... with a broad felt pen, the vertical and horizontal lines are easy to line up in the crosshairs. I do the same.....I use targets with a square bull area and nestle a corner of the square in the corner of the cross hair. I hold my crosshairs over the full width lines on a diamond sight in target when sighting in a scope. For shooting groups, I like a small 3/4" orange sticky dot against a white background with something like a 2-7 scope at 100 yards. I find the contrast makes it easy o see where I am holding compared to the regular black and white squares. Here are some groups I shot during load development with that exact same scope on a Ruger GSR. I'm not one for switching optics around, once a scope is on a gun it's basically on for life (for my guns). I habitually throw the third shot but those are 5 round groups. 100 yards, prone off a pack.